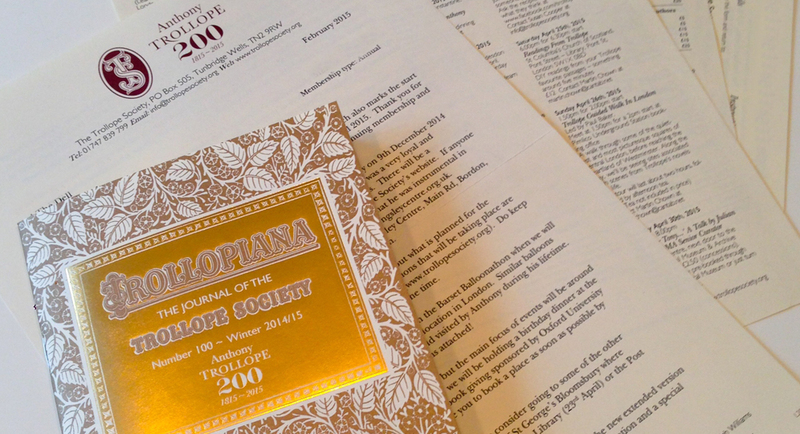 Members of the Society receive three issues of Trollopiana a year. 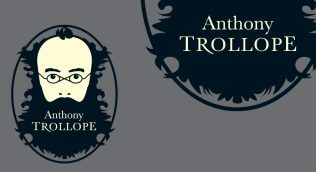 Filled with articles on Trollope’s life and works, as well as Society news and updates on seminars, events and activities, Trollopiana is the best way to keep in touch with all things Trollopian. Members can also access the back catalogue of Trollopiana pdfs here on the website. This valuable resource includes essays and articles by numerous Trollopian academics and authors. Becoming a member is the only way to have online access to the full back catalogue of Trollopiana, but here you can see what you’re missing out on with a one off free edition. 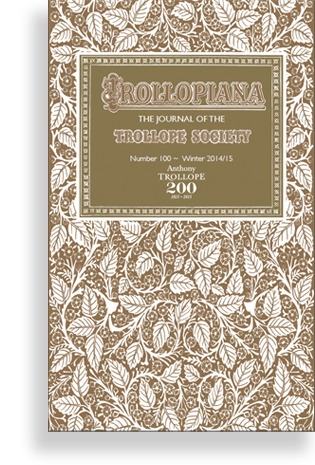 Download your sample copy of Trollopiana number 100, published in Winter 2014/15. 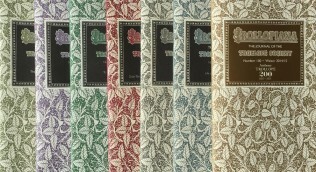 This special bicentenary issue is foil blocked in gold to celebrate the 200th anniversary of the birth of Anthony Trollope. Contents include: ‘A History of the Trollope Society’ from its foundation in 1982 to the present day; ‘What they said about Trollope at the time’, the first in a three part review of contemporary critical responses to Trollope’s novels by Dr Nigel Starck; and ‘The Lost Chronicle of Omnium’ – Professor Steven Armarnick’s lecture on the restoration of the complete edition of The Duke’s Children. We hope that you’ll then want to become a member to access to the full back catalogue.